Also known as Tiger Gate of Rajasthan, Alwar is a popular city and is known for its historical monuments in the form of palaces and forts. But do you know there is more to be explored here? Yes, apart from historical beauties, you can also savour the grandeur of lakes, hills and parks, and get in touch with the natural expanse of Rajasthan. The history of Alwar dates back to the 11th century when the king of Amer was ruling the region. Hence, the city is home to hundreds of ancient marvels today. From palaces to forts and cenotaphs to temples, each and every corner of Alwar is worth exploring. So, what do you think about a tour of this undeniable beauty? If you live in and around Jaipur, then you should not miss out on such a great destination where you can enjoy hundreds of tourist spots. Read on to know more about how to reach Alwar. Alwar experiences hot summers and hence, it is a less preferred destination during the summer season. The best time to visit Alwar is from October until the end of March. During this period, the beauty of its lush green hills is at is peak and the weather is absolutely favourable. You can also visit during the monsoon season, i.e., in the months of July and August. By Air: The nearest airport from Alwar is located in Jaipur and hence, there is no option of reaching Alwar by air if you are starting your journey at Jaipur only. By Rail: Alwar has a well-maintained railway station and hence, you can catch a direct train from Jaipur railway station to Alwar Junction. It will take you an approximate time of 2 h 30 min to reach your destination. By Road: Alwar is easily approachable by road. Hence, you can either hire a cab or catch a direct bus to Alwar from Jaipur. As route 1 will take half an hour lesser in comparison to the other route, it is preferable. You can reach your destination within 3 h via route 1. On your way, you can take a break at Dausa and explore its beautiful tourist spots. Dausa is located at a distance of about 60 km from Jaipur and 100 km from Alwar and hence, it is a perfect spot to take a break at. It is one of the few places in Rajasthan where you can find innumerable historic sites and hence, it is one of the most visited tourist centres amongst history lovers. From stepwells to forts and palaces to memorials, there are hundreds of historic sites. It is also home to numerous age-old temples which have been worshipped by locals for centuries. The major places which you shouldn't miss visiting here include Abhaneri, Bhandarej and Khawaraoji. Neelkanth and Panch Mahadev are a few religious sites in Dausa. Surrounded by beautiful green hills and nestled in the midst of lush vegetation, Alwar is located at a distance of about 160 km from Jaipur and showcases the rich history and culture of Rajasthan. It isn't easy to find such great destinations in Rajasthan where you can get in touch with every kind of beauty, be it regarding history or nature. Do you really think you can easily come across such an amazing mix of hills, lakes, forts, palaces and temples? 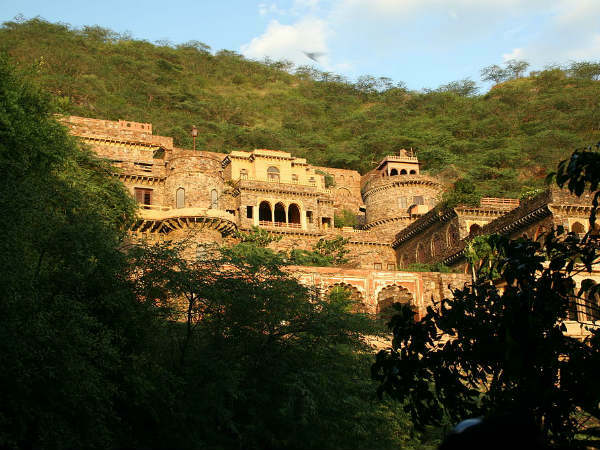 If not, then Alwar deserves to be on your bucket list this season. Following are the major places to visit in Alwar. When the talk is about any place in Rajasthan, how can someone ignore the majesty of forts and palaces? Therefore, it is necessary to discuss about the actual splendours of Alwar which are flourishing in the form of forts and palaces. Also known as Bala Quila, Alwar Fort is the most prominent historic building in the city and dates back to several centuries. Hence, it is a weekend destination for history lovers. Other ancient monuments here include City Palace, the cenotaph of Moosi Maharani and the hill fort of Kesroli. Once you are done with exploring the ancient beauty of Alwar you can move on to contemplating its natural beauty which is spread in the form of Sariska National Park. Established in the year 1955 and spread over an area of about 866 sq km, this beautiful national park is a famous tiger reserve now and is frequented by thousands of tourists every year. Apart from tigers, the major species found here include India leopard, jungle cat, wild boar and sambhar. Due to the presence of several beautiful species of birds, it is also a weekend spot for several photographers and bird-watchers. The major reason why Alwar is equally popular amongst historians and nature lovers is the presence of beautiful lakes which help in maintaining a natural environment at Alwar. Siliserh Lake and Jaisamand Lake are two prominent water bodies here. India is one such country where you can find temples and religious sites every hundred metres. Then, how can Alwar be an exception here? The major temples and religious sites here include Bharthari Temple, Ashoka's Buddhist Stupa, Pandupol Hanumanji Temple and Neelkanth Temple.